Aphelion Day is the day that the Earth and Sun are at their furthest distance from each other. Every July the Earth is at aphelion, the furthest from the Sun for the year and in January it is at perihelion, the closest to the Sun for the year. Earth's orbit shown from above the Sun's North Pole; seasonal references are for Earth's Northern Hemisphere, and would be opposite for the Southern Hemisphere. Each year during the first week of July the Earth is at the point in its orbit called aphelion, which is its farthest distance from the Sun, 94.5 million miles / 152 million kilometers. In 2018 the exact time of aphelion is July 6 at 9:47am PDT (16:47 UT). On July 6 we are 94.5 million miles away from the Sun, which is 3 million miles further away than when our Earth was at perihelion on January 2, 2018 at 9:35pm PST (05:35 UT Jan. 3). We are so far away from the Sun in July that its light is 7% less intense than it was in January! The above image is a composite of two pictures that Luis Carreira * took from opposite ends of Earth's orbit: perihelion and aphelion. When the Earth is at aphelion, the Sun looks a little smaller than usual. Image: Westchester Amateur Astronomers, Inc.
Hmmm ... Why is it colder in January for the Northern Hemisphere when the Sun is closer? Why is it hotter in July for the Northern Hemisphere when the Sun is farther away? What's the weather like in the southern hemisphere for July? The tilt of the Earth plays a big role in answering these questions. Here's a fun and simple explanation about the winter and summer Sun ... with the following disclaimer! You might expect northern summer to be cooler because it occurs when Earth is farther from the Sun. Not so, explains Roy Spencer of the Global Hydrology and Climate Center [Now known as the Earth Science Office]. "The oceans and land on Earth are not evenly distributed around the globe. The northern hemisphere has more land; the southern hemisphere has more water. 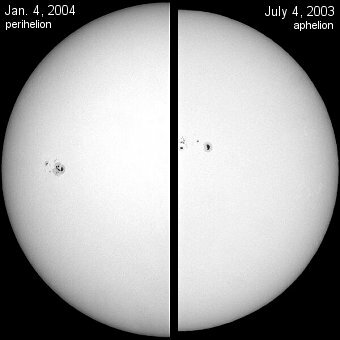 This tends to moderate the impact of differences in sunlight between perihelion and aphelion." Here are a few more Earth/Sun facts as well as a review of perihelion and aphelion. Here's a year to year chart of Equinoxes, Solstices, Perihelion, and Aphelion. Enjoy! and we are free to travel the Milky Way!